We will strive each & every day to provide the highest level of personalized care possible in a comfortable home-like setting. Our 20 bed assisted living facility for seniors is the perfect blend of comfort and elegance. Small enough to provide an environment where every resident is intimately known and cherished, and large enough to provide many of the same amenities & services of the much larger facilities. We are like a small batch winery, where every grape is know and handled with care. If you look carefully when you enter our doors, you will still see remnants of an earlier time, when this Victorian home was the ‘Roses & Ivy Tea Room’. With that history echoing off our walls, we have worked very hard to maintain that elegant Victorian feel inside our home and on our beautiful grounds, while providing the highest levels of care in the North State. Pull up a chair and listen to the sounds of the big bands from the 1920’s, 30’s, and 40’s spinning on our Columbia Graphaphone. 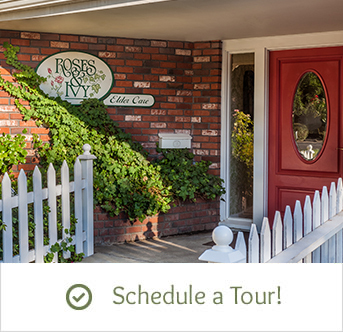 Drop by and see for yourself… or give us a call and we’ll pick you up in our van for a private tour. And by all means, ask around about us…our reputation for extraordinary care is well-known throughout the area.